My sculpture over the last 40 years has gone through a lot of changes. From the decorative object to the narrative story, I have worked through many personal issues. My awareness of death and the insanity of war has been the subject of several pieces; the violation of someone’s life angers me to the point that it has to be released in the art. Other issues, such as fears, insecurities, and politics, also have fueled the fires of my creative process. To me, my art is the residue of all my life experiences. In college I became interested in clay because of its immediacy: if you squeeze it there is an instant result. With the addition of paint, leather, and flocking, I created a more diverse surface that enhanced the overall form. I turned to wood next because it was flexible, easy to shape, and less fragile than clay. As works progressed, I sought out other materials to engage the wood, such as leather, lead, and found objects, whatever it took to define the idea. Most recently, wood pieces were cast in bronze to achieve greater permanency, resulting in works that for the first time could withstand outdoor elements. What excites me now are the ideas and new learning experiences yet to come, all which will add richness to the art that I still plan to create. 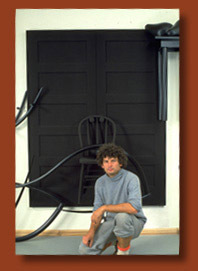 For nearly four decades I have exhibited across the country, and my work is represented in a number of national collections, including those of the Smithsonian American Art Museum, Washington, DC; the Oakland Museum of Art, CA; the Tacoma Museum of Art, WA; and the University of Virginia Art Museum, Charlottesville, VA.